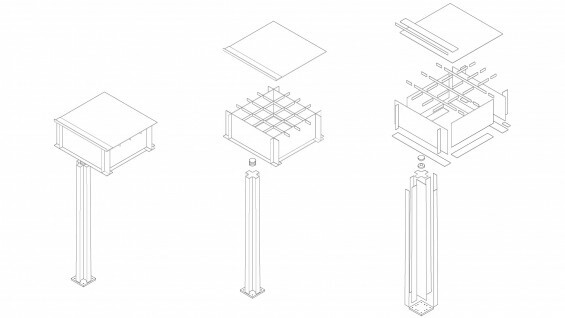 Cruciform column and roof grid of Mies van der Rohe's New National Gallery. Presented by powerHouse Books and Fridman Gallery, a book launch for Construction Matters will take place on Tuesday, February 23, 2016 at 7:30pm, at the Fridman Gallery: 287 Spring Street, New York City. To attend this event, please RSVP to info@fridmangallery.com. Construction Matters examines the way that architects understand and respond to technological innovation through the creation of new types of spaces, and the materials through which an architectural idea finds its physical realization. Understanding the properties of different materials is indispensable for the creation of architecture that is original, powerful, and meaningful. Organized into chapters on the major methods of construction--masonry, concrete, steel, and wood—Construction Matters examines specific technologies that experienced major transformations in the last century, or were newly invented: a new material, jointing technique, or fabrication procedure for example. The architectural application of this invention is then analyzed with building case studies that are selected based on an obvious formal relationship between the building's form and the new type of construction that it incorporates--ranging from prewar designs in the United States and Europe to recent projects in Asia and includes built projects as well as significant design proposals. Construction Matters develops a way of thinking about architecture in relation to technology that transcends a particular building method or design task. It is based on Windeck’s architectural practice, teaching, and independent research that ranges from scientific advancements to philosophical contemplations. The multi-facetted discussion that emerges from this work is developed in close collaboration with artist and journalist Lisa Larson Walker (A '09), with mathematician and architect Will Shapiro (AR '11), and with artist and architect Sean Gaffney (AR '10). If we are to rescue the physical substance of architecture--the Matter of Construction--and create a practice that celebrates both the physical and the metaphysical aspects of building, we must understand how and why Construction Matters.